This report highlights eight years of START’s Africa GEC Grants Program, focusing on the significance and development of the program for GEC research in Africa and the major accomplishments of grant award recipients from 2004 to 2012. Research findings featured in this report illustrate the breadth of research and key discoveries supported by the GEC Grants Program. The findings are organized under three themes – land dynamics, livelihoods and environmental change, and climate systems. Research on land dynamics involved studies on biogeochemical processes, drivers of land use change, land management, and biodiversity; the livelihoods and environmental change research addressed perceptions of climate variability and change, responses to climate risk, and natural resource management; and, grant awards on the climate system investigated the past and present drivers of climate variability and change through paleoclimatology fieldwork and climate modeling. The Grants for Global Environmental Change Research in Africa Program has conferred multiple benefits associated with advancing GEC research-for-action in Africa. 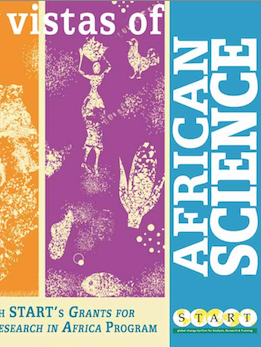 These include strengthening linkages between researchers, local communities and national decision makers; advancing scientific knowledge of GEC impacts in Africa (grant award recipients have published over 50 academic articles while another 50 are in development); and providing exposure of young African scientists to GEC research methods and approaches, with over 300 students, predominately at the post-graduate level, having participated in the research projects over the duration of the African GEC Grants Program.